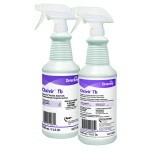 OXIVIR – KILL Parvo Virus in Under 5 minutes, Vet Grade Disinfectant. 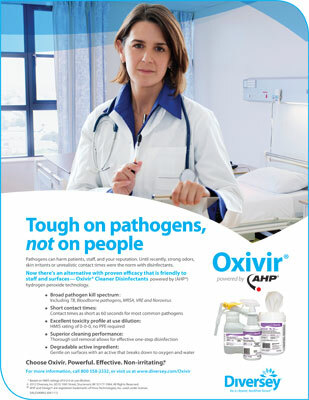 Tough on Pathogens, not on people. Virox Animal Health™ services the Veterinary and Animal Shelter markets with products that kill tough germs like Parvovirus—FAST but are safer on animals, users and equipment. Virox Animal Health is proud to partner with Dr. Marty Becker (America’s Vet) and his Fear Free℠ initiative that promotes a stress-free pet experience. Unlike other harsh disinfectants, AHP® powered products do not burn paws, leave overwhelming odours, affect skin or corrode equipment. AHP’s low environmental impact makes for easy, guilt-free disposal and sustainability of all animals on our planet.Pathogens can harm Animals, staff, and your reputation. Until recently, strong odors, skin irritants or unrealistic contact times were the norm with disinfectants. Used by Vets, Boarding Kennels, Stables and any area populated by animals where bacteria breed and Disinfection is important. Now there’s an alternative with proven efficacy that is friendly to staff and surfaces — Oxivir® Cleaner Disinfectants powered by (AHP®) hydrogen peroxide technology. Tough on pathogens, not on people or animals. Pathogens can harm people, animals staff, and your reputation. Until recently, strong odors, skin irritants or unrealistic contact times were the norm with disinfectants. A one-step disinfectant cleaner based on proprietary Accelerated Hydrogen Peroxide (AHP®) technology to deliver fast, effective cleaning performance. At 1:16 dilution, disinfects in five minutes. Virucide, bactericide, fungicide, mildewcide and non-food contact sanitizer. Kills MRSA, Norovirus and Canine parvovirus. Concentrate delivers economical performance. Meets bloodborne pathogen standards for decontaminating blood and body fluids. Colourless with a characteristic scent. OxivirTb™ cleans and kills bacteria, viruses and fungi quickly in one action and the active ingrediant leaves nothing behind except water and oxygen. It is a patented product with synergized hydrogen peroxide. 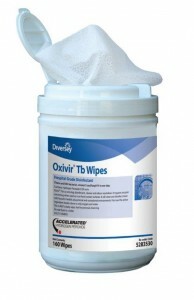 OxivirTb is available as a ready to use liquid or large wipes. other fixtures, toilet exteriors, waiting rooms, operating rooms & shower rooms, Kennels, cages, floors and Pens. OxivirTb can be used to clean and disinfect non surgical items like equipment,cages, and other non-critical medical surfaces. Not for use on glasses, dishes and utensils or therapeutic devices. Not recommended for use on brass, copper or marble. Degrades to oxygen and water. All hydrogen peroxide products rapidly degrade to oxygen and water but only syngerised OxivirTb can disinfect using a much lower active content of hydrogen peroxide of 0.5%, rather that standard hydrogen peroxide which has a 3% active content. With less active, there is less to break down. The rapid disinfecting action and the rapid breakdown of the active also mean that there is no residual active available for the microorganisms to develop resistance to. OxivirTb contains a high load of both anionic and non-ionic surfactants which are both good detersive agents. OxivirTb as a ready to use product has almost 10 times the amount of detergent found in a typical diluted neutral detergent mix. The acid anionic component of OxivirTb also gives effective descaling properties that leave minimal streaking for that prestige finish. The detergent in OxivirTb will emulsify fatty soil and enhance the ability of the applying wipe or cloth to remove the fatty soil from the surface. OxivirTb can be used with microfiber without any effect on the microfiber cloths or mops. OxivirTb is certified as Woolsafe and therefore safe to use on woollen carpets. With OxivirTb’s low active concentration there is no normal requirement to use Personal Protective Equipment like safety eyewear. No rinse, With the active readily degrading to oxygen and water, the cleaned surfaces do not need rinsing. It is good practice however to rinse food contact surfaces. Quick Kill Time U.S. trial data has shown that OxivirTb kills viruses and bacteria in one minute and fungi in 10 minutes. The Australian TGA registration requires a 10 minute kill time for bacteria so that is the label claim. The Quick kill feature comes from the patented synergistic formula. OxivirTb with Accelerated Hydrogen Peroxide™ disinfects in 1 minute with only 0.5% hydrogen peroxide while the standard hydrogen peroxide disinfectant with 3.0% hydrogen peroxide can take up to 75 minutes to disinfect Poliovirus type 1. Unlike most disinfectants no perfumes, colognes or other scenting agents are added to AHP products.To us the word ‘clean’ means the absence of ANY smell.When AHP is used regularly in any establishment the lack of offensive odours can be remarkable.OXIVIR utilizes AHP chemical technology. AHP (Accelerated Hydrogen Peroxide) is a synergistic blend of commonly used, safe ingredients that when combined with low levels of hydrogen peroxide produce exceptional potency as germicide and performance as a cleaner. The benefits and efficacy of AHP have been validated by third party clinical studies conducted by scientific organisations and third party researchers that are recognised by government regulatory agencies in Canada, the U.S and Europe. AHP has an excellent Safety and Environmental Profile for the user and the environment. There are no toxic ingredients in the formula and it does not leave any residual on the surface once dried. It has no colour, is non-irritating to eyes and skin and free of Volatile Organic Compounds (VOC’s). Volatile Organic Compounds (VOC’s) are emitted gases from certain solids or liquids. VOC’s are emitted by most cleaning products. VOC’s can adversely affect indoor air quality and the inhalation of air containing such compounds released by cleaning and disinfecting agents has been associated with allergies and occupational asthma. See more information below. What is the difference between AHP and the Hydrogen Peroxide that can be purchased at a Pharmacy? Hydrogen Peroxide purchased at a Pharmacy is a 3% solution mixed with water. Scientists have worked for many years to find a way to properly mix other ingredients in this water and Hydrogen Peroxide solution and create a commercially viable and effective product. AHP is a formulation of Hydrogen Peroxide, surfactants and other inert ingredients which results in less active ingredient but better cleaning and faster germicidal performance than Hydrogen Peroxide at 3%. At the In-Use dilution of AHP for bathing the active ingredient is less than 0.1%. Many cleaning and/or disinfectant products on the market have pleasant smells such as citrus, lime etc. Why doesn’t AHP have a scent? A reason for creating a scent-free product is to avoid the masking of odours. Clean really has no smell. It is the absence of smell due to the absence of any odour causing materials. When you clean and disinfect with AHP there isn’t a scent to mask the cleanliness. Your animal, room or facility will eventually just smell clean. Addition of scents which very often contain Volatile Organic Compounds (VOC’s) to cleaning and disinfectants is also one of the leading causes of fragrance sensitivity and negative affects to indoor air quality. By creating a product that is scent free, there are fewer negative reactions by end users, fewer complaints by occupants of the facility using AHP and therefore, from a Occupational Health and Safety standpoint, a better product to use. Hydrogen Peroxide is an oxidising agent, meaning it will oxidise and destroy certain compounds. Typically, the scents used in most cleaners fall into this group. It would be difficult to find a scent that would stay stable in the solution. Can I mix Bleach with AHP? As with many chemicals mixing bleach (or other chlorine products such as Trifectant, Virkon or WisiWash) with AHP products has the potential to produce a toxic gas that is dangerous. As such cloths, mops or other items that have been used with chlorine based products should be thoroughly rinsed or preferably replaced prior to using Accel. We are experiancing a bad odour after cleaning and a slippery/sticky film after cleaning, Will this go away? When using a residual chemistry (quats, phenols) there will be a layer on the surfaces that Accel’s superior cleaning properties will start to strip away. This can expose organic material that can be slippery and give off bad odours. This will go away once the layer of residue has been removed either by several good cleanings or a single vigorous cleaning. Will AHP affect floor finishes or wax? How about rubber floors or matting? When used at the appropriate dilution rates AHP should not have any ill effect on floor finishes and is safe for virtually all surfaces including rubber floors and matting. Can AHP be disposed of into a septic system? The active ingredient found in the AHP line of products is hydrogen peroxide which readily biodegrades into water and oxygen upon entering a sewer or septic system.Our experience indicates that properly maintained septic systems can handle normal wastes generated from the use of AHP formulations. Many products say they are a one step disinfectant. Do they all perform the same? Traditional products that state they are one step disinfectants are actually quite poor cleaners.In standardized government tests for cleaning efficacy traditional disinfectant chemistry (quats, chlorine, etc.) 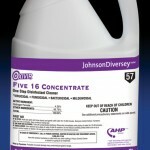 achieved only about 16% cleaning efficacy.In contrast some products in the AHP range hit 98.77% on the same tests.